1940s Philips Radio The World of Entertainment - theVintageMapShop.com - the Vintage Map Shop, Inc. 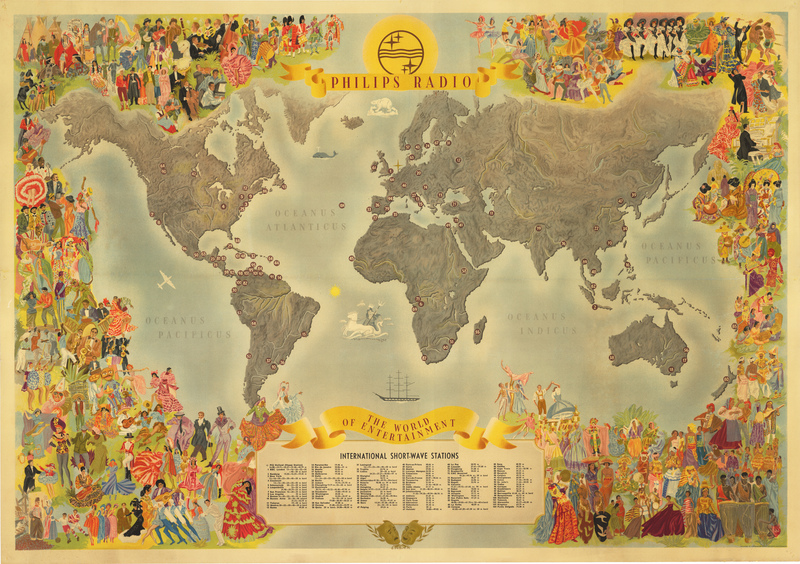 This is a fine print reproduction of a marvelous and scarce Philips Radio pictorial promotional world map that features the locations of dozens of global shortwave stations. The stations are represented by small red circles, which are superimposed on an outline map of the world. They are numerically keyed to a legend located at the lower center of the map which includes the call sign and frequency for each station. The borders are filled with lively images from the world of entertainment, and focusing primarily on the world of the performing arts. Emphasis is on the dance traditions of myriad cultures around the globe, with brightly colored native dress and costumes rendered, with examples ranging from vaudeville to Elizabethan theater, and song and dance from the samba and other local music and dance of indigenous peoples to the waltz and classical music. Philips Radio, whose parent company was established in 1891 in Eindhoven, Netherlands, was an early manufacturer of incandescent light bulbs. The company had met with success early on, as it signed large contracts with parties such as the last Tsar of Russia to provide lighting for the grandiose Winter Palace in St. Petersburg. It went on to become a leading innovator in consumer electronics, pioneering many of the earliest electronic consumer goods to be introduced with such products as radios, electric razors and compact discs. Today Philips is a mammoth multinational corporation, producing a wide range of products from Blu-ray players to healthcare imaging devices to LED light bulbs, with turnover in 2015 of more than 24 billion Euros.